Germany commemorates the 50th anniversary of the construction of the Berlin Wall this weekend. 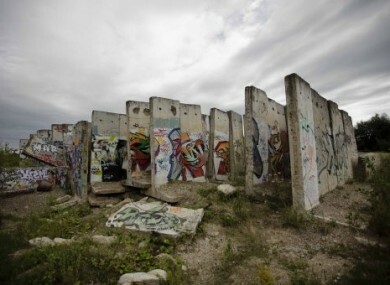 Parts of the wall are still standing in Germany, serving as a reminder of the past. EAST GERMANY BEGAN building the Berlin Wall exactly 50 years ago today. Although leaders claimed it was being built to protect citizens, it was generally known the Wall was erected to stop people leaving the Communist bloc. Between 1949 and 1961, about 3.5 million people were said to have left East Germany and the Communist leaders wanted to ensure no more of the population was culled. The anniversary of the construction of the wall will be marked in Germany this weekend as a reminder of the country’s troubled political past. The Wall remained in place for 28 years, isolating East Germans from their family, friends and jobs in the West. "Niemand hat die Absicht, eine Mauer zu errichten!" (Nobody has the intention to erect a wall) - 15 June, 1961 Walter Ulbricht, the East German communist ruler declared this less than two months before construction began on the night of August 13. East Germany were trying to prevent more citizens from leaving as over 3.5 million had emigrated or defected in the preceding years by crossing into West Berlin and travelling from there. Intimidating - East German tanks are lined up at Warschauer Bridge on 13 August 13, 1961 as the border is closed. East German soldiers, left, set up barbed wire barricades on this day 50 years ago. West Berlin citizens, right, watch the work but do not seem quite aware of what exactly is going on. An East German couple is turned away from the border, blocked by East German soldiers and barbed wire, after trying to cross into West Berlin on 13 August, 1961. Residents did not know the effect the Wall would have on their lives. People were separated from their families, friends and jobs. In another candid shot, photographer Peter Hillebrecht shows how ill-prepared people were for the effects of the dividing wall. Taken on 13 August, 1961, the image shows two men dressed only in their swimming trunks after fleeing across the high security border separating the East from the West. When the wall was first built, nobody knew what was going to happen next. This photo shows some of the first work carried out on the Berlin Wall in August 1961. It is thought that up to 200 people could have died whilst trying to cross the border into West Berlin. Günter Litwin was the first victim of the 'Death Strip'. He was shot down by East German border guard in Berlin on August 24, 1961. Just a couple of weeks after the initial construction, two East German workers put pieces of broken glass on the top to prevent East Berliners from escaping. It wasn't long before the Wall was made higher. Here, an East Berlin policeman can be seen putting bricks in place to heighten it to 15ft, or 5m. People watch from their apartment building windows in the background. A boy sitting on the shoulders of another child peers over the wall just days after it was constructed. The wall eventually got much higher and was covered with broken glass and barbed wire to deter escape attempts. The wall got continuously higher, longer and more perilous to cross. This photo shows East German soldiers at the allied Checkpoint Charlie crossing, near the Friedrichstrasse, working on another layer of the wall in 1964, three years after it was initially built. Checkpoint Charlie was probably the most famous crossing point as it opened just 10 days after the borders were closed. Diplomats, famous people, foreign tourists and military from other countries were allowed to enter through the checkpoint. A year on - on August 13, 1962 West Berlin youth protestors carry a black cross with the slogan "We Accuse". They are driven back from the sector border wall by tear gas from grenades fired by East German border guards near Wilhelmstrasse. Reverend Martin Luther King, American civil rights leader, visited Berlin in 1964. There were many famous visitors to the Wall, including multiple American presidents. Conrad Schumann, a former member of the East German Army, was the first soldier to escape over the wall into the more free West. Here, he points at a photograph depicting the moment of his border crossing on August 15, 1961. This image was taken in 1981 as West German commemorated the 20th anniversary of the wall. US President Ronald Reagan acknowledges the crowd after his speech in front of the Brandenburg Gate in West Berlin, where he said "Mr. Gorbachev, tear down this wall!" on June 12, 1987. 1989 - the year it came down: Although the Wall came down later that year, refugees were still in danger. Here, two East Berliners are taken away by border guards, who can be seen holding their rifles to them, after a thwarted escape attempt at the Chausseestreet border crossing on 10 April 10. Cars carrying tourists who are allowed cross the border can be seen in the background. A man on top of the Wall near the Brandenburger Gate chisels a piece of the Wall on November 10. People scrambled to the barrier on November 9 when East German Politburo member Günter Schabowski declared that travel restrictions for residents would begin "immediately". It is thought that the junior MP made an error as he was only meant to be announcing temporary bureaucratic procedures to make it easier for East Germans to travel abroad. He was pressed hard by journalists Riccardo Ehrman and Peter Brinkmann who both claim they asked the question that led to the biggest political blunder in modern history. The border between East and West Germany officially opened on 9 November, 1989. This image was taken the following morning as people felt freedom for the first time in 28 years. There is no definitive number of how many people died trying to cross the Berlin Wall but researchers believe it is between 150 and 200. The area where people were killed or died in escape attempts was infamously known as the Death Strip. Portraits of some of these victims are displayed at the Berlin Wall Memorial at Bernauer Strasse in the city. Earlier this year, a statue depicting a dying Peter Fechter being carried away by the East German border guards who shot him down, was destroyed by vandals. The temporary sculpture had only been installed for two weeks before it was targeted. The piece by Florian Brauer was inspired by an iconic photo taken on 17 August, 1962 (earlier in this slideshow). This weekend, Germany will commemorate the building of the wall and remember the victims who died trying to escape East Germany after its construction. Here, an artist rehearses ahead of tomorrow's performances. The iron bars are symbolizing the Berlin Wall and are set up where the original Wall stood at the Wall Memorial at Bernauer Strasse. Almost 22 years since the Wall was taken down, tourists still flock to the memorial sites throughout the city. Some parts of the wall are still standing in some parts of the city. They serve as a reminder of Germany's troubled past. However, they also highlight another phenomenon - the idea of selling goods online. Pieces of the Berlin Wall are currently available to purchase for where between €30 and €300on eBay. Email “In photos: 50 years of the Berlin Wall”. Feedback on “In photos: 50 years of the Berlin Wall”.